Lee Heiss Coaching has clients all over the world and is building a global network of associate coaches and facilitators. For the last 16 years, we have been providing corporate coaching and facilitating services to organizations in Asia Pacific; and running public self-development workshops and coach training programs in Singapore, and one-on-one coaching sessions for people based in various cities in the US, Europe, Asia and Australia. We are highly innovative and results focused. We make sure we do everything we can to deliver the desired results to our clients, with their full collaboration and participation. 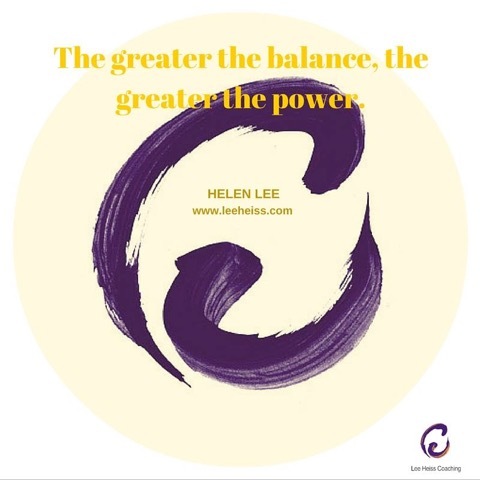 Helen Lee, our Founder and Principal Coach, created all our programs for corporate and individual clients. She delivers them herself and also engages her network of well qualified and experienced Associate Coaches and Facilitators to support her in various parts of the world. She either trains or/and mentors them herself. Helen Lee's joie de vivre is infectious! Highly innovative and forward-thinking, she is an inimitable mix of enthusiasm and groundedness. Coaching is for anyone who wants to improve in all ways or to step up to higher levels in some or all areas of their lives. It is not only for people who have severe problems or are at crossroads. Our programs are designed to bring maximum change and benefit to everyone but clients decide for themselves just how much change and what kind of results they want or are ready for. Our logo is a stylised and contemporary version of the yin yang symbol which stands for balance and harmony. We coach our clients to journey through The Path of The Invincible™, J.O.Y. – The Journey of Yes™ or The Journey Home™ – a path that we personalize for them, to lead them towards self mastery and real success in all areas of their lives. We help them move towards mastery at all levels: physical, emotional, mental and spiritual. We have an extensive track record in coaching corporate leaders at all levels, from Chairmen, Presidents, CEOs and Board Members to middle management and high potentials primarily from MNCs in Asia Pacific. We also coach individual leaders globally. Our expertise lies in coaching both leader and team to bring real transformation to the entire organization. What sets us apart is our unique approach of leadership creation and teambuilding. Our ontological coaching technology and programs can result in the spontaneous emergence of greatness in leaders, individual executives, the whole team and the entire organization. It is designed to fire up people, bring courage, innovation and passion to the workplace, and increase productivity and profitability as a natural process of growth and transformation of the individual and the group.